A Simple And Very Cost Effective Solution. For people who own or manage a business, the front desk matters! Giving a good impression is vital to attract new business and to keep existing customers happy. For most companies working on a small scale, cost is the central issue. Many would love to employ a receptionist to provide the perfect answer but haven't got the budget. Roselawn House can provide a simple and very cost effective solution. You have only one chance to make a first impression on your clients and at Roselawn House, our friendly Receptionists will greet your customers on arrival and also provide a personal telephone answering service. 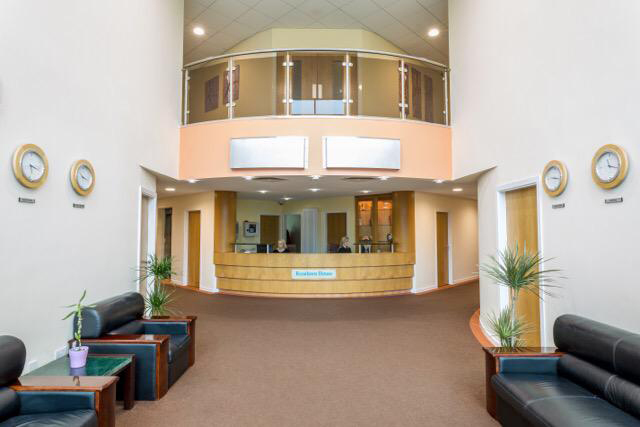 Our reception area provides the ideal welcome for your customers and, whether it is the individual calling for an appointment or a number of your clients calling for a meeting in the boardroom/conference room, our Receptionists will greet them and direct them to the various facilities. We also provide optional additional services such as typing, photo-copying, faxing, etc. and no matter how big or small your request, we will do our very best to assist you. So, whether you are a well established business or just starting out, your clients will perceive a professional business image. © Roselawn House, University Business Complex, National Technology Park, Limerick.